When I in Project Edit, select "Exclude Files and Folders" and press "Add Folder", it shows .zip files as folders. If I read "Script.ProjectSettings.SelectedProjectExcludeFilters" from a plugin, I get a list of files/folders back, separated by a linefeed. But how do I distinguish between files and folders? As it seems you can add files from the "Add folder" GUI panel. 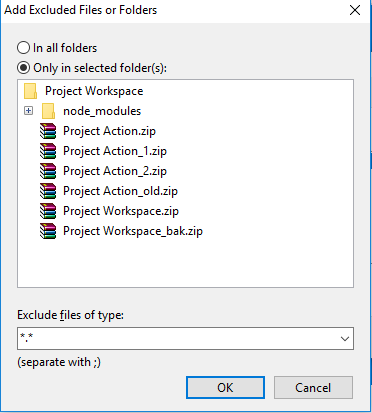 I press the "Add Folder" button, select a folder ("dummy") in my Project tree and then set the "Exclude files of type" to "dummy.txt"
Then I go to the same folder and select a file named "dummy.txt". Both are exactly identical, and there's no special separator between folders and files. I would suggest to use DirectoryExists function to check if it's a folder and if it still exists, because there are times when users will specify folders and later they get deleted or renamed.